I have done a presentation for a web-security firm in 2011. The presentation is here, and it is live, my voice and picture included. I talked to a crowded room. I was nervous but it went fine. Recently, I needed to find a reference about Steve McQueen using the word scam for the first time. There was an interview, it was published in Time Magazine in 1963, but I couldn’t recall who the author of the article was. So I googled Steve McQueen and scam and Time Magazine. There was a hit and the wording seemed familiar. So I clicked on this link. If the link is removed, as I suppose it will be, after this becomes public, here is a screenshot of the page and here is the locally stored pdf (fun starts at third slide). Interesting, right? Amon even took the pictures from my presentation, not only the text. I would be interested to know what the Royal Holloway has to say. I shall contact them later and post their reply here. If we ignore the first two slides, the only thing Amon did, was replace my name with his and changed the background. Not bad, right? Certainly much easier than going to the trouble of researching this. Let’s look into Amon Sanniez, the plagiarist. Here is his linked-in page. It seems that years of expertise in security and in ownership (heh) have landed him a job a company that does pest control. He used to work for security firms and has lots of qualifications, but not much academic clout (a BSc was the end of the road). He does list my presentation as his publication on linked-in. Here is his blog. The subset of the things he writes about is in my field of expertise and he is not completely on the ball there. The things he writes about there are presented with a simplistic point of view and they are often bounded by a lack of knowledge of the field. The biggest irony is that Amon replicated my presentation but I now know where I was mistaken and he does not. Several of the things I say are just plainly not true now, and were problematic then, but we (the real scientific community) didn’t know it at the time. Oh well, best of luck with your future prospects Amon, I am not too bothered about you stealing my work, because I moved forward since, and you, well, not so much. 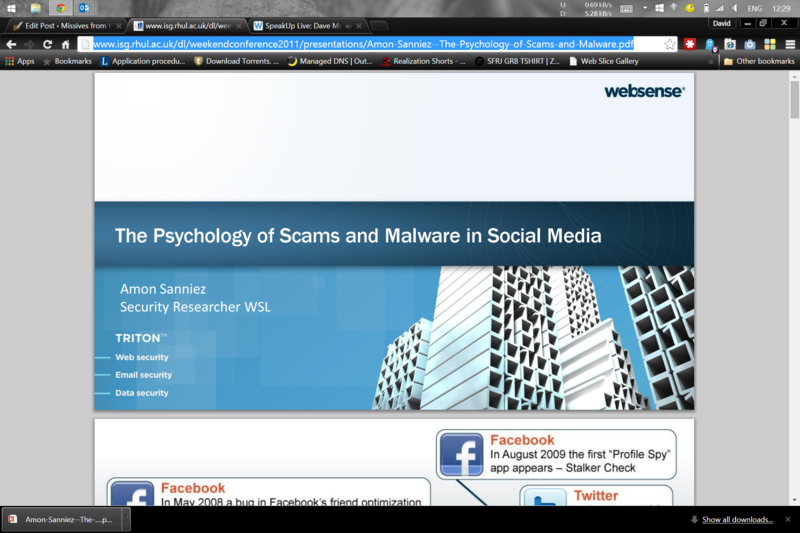 In June 2011 I gave a talk at BAFTA for the company Websense on the topic of Psychology of Internet Fraud. Here is a link to my talk: http://www.websense.com/assets/webinars/speakup/speakup-live/psychology-of-scams/ (with my photo and audio narration). When I looked a bit closer, I realized that this was my reference and the whole thing to be a direct copy of my presentation with only my name replaced and the template background changed. The first two slides are not mine, but all the others are, word for word, including the clipart. Feel free to check both links above. I looked at the event and it turns out it was held by the Royal Holloway Security Group in September 2011, if I understand correctly. The slides are hosted on the Royal Holloway pages. 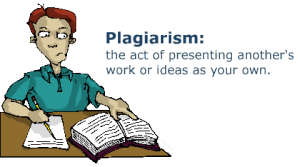 Your group was of course not to know that Amon Sanniez plagiarised my research and in the grand scheme of things it does not matter much anyway, but I thought you should be aware of this. If you paid anything to the presenters you were also scammed, in a sense. I guess there is irony in talking about fraud by committing academic fraud. I also realize that mr. Sanniez has no affiliation with RHUL. Anyway, I just thought you should know. I don’t have any expectations about what happens next, it is completely up to you if you want to pursue it in any way. Please note that if I found plagiarized work hosted by Royal Holloway in about 30s through google, others might too, and that may reflect badly on the RHUL, even though I don’t think any of this is in any way the security group’s or the University’s fault. I am sorry to be the bearer of bad news.